Now, I’m fond of dolphins, having shared the shore with them for ages at Virginia Beach. (But I can never catch up with them, darn it.) 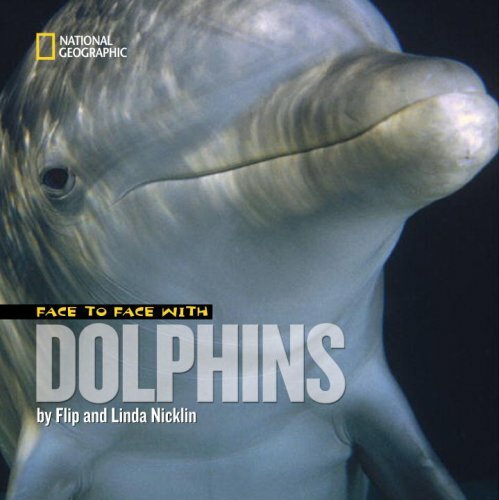 If you’re not a fan, you will be after some time with Face to Face with Dolphins, by Flip and Linda Nicklin. The photos are fantastic  more the point of the book than an afterthought as they are with some nonfiction titles. Of course, National Geographic is the publisher of this book, so maybe I shouldn’t be so surprised. Wonderful photos fill whole pages, drawing you into the scene. Dolphins have one baby at a time. Youngsters stay close to their mothers in the first months of life, learning from them. I once watched a baby orca in Alaska swimming with its mother. The mother was teaching the baby how to catch fish. She chased a salmon, a kind of fish, just enough to keep it close. Then the baby orca would try to catch it. The book has little sections throughout  How to Swim Like a Dolphin, How to Speak Dolphin  that allow the reader to copy the dolphin’s style for a little fun n’ games. The book is also one of a series, Face to Face with Animals  so if dolphins ain’t your thang, you can try lions, frogs, or elephants. If you like some photographic artistry in your animal books, this series will win you over, no doubt. That cover makes me smile. I love dolphins.